This May, our reflections on Mary have been quiet ones. We haven't done a whole lot of crafting. We even missed the parish May crowning. But, the quiet suits me right now. We have talked about how the Blessed Mother was full of grace and we have each been thinking what that means exactly and how we, too, can be filled with grace. Early in May, I took my scapular medal and my medal of Our Lady of La Leche from the gold chain around my neck. Karoline had been grabbing at it and pulling and I was afraid that one day, the chain would break and the medals would be lost. I also wanted to make something that set off the loveliness of what those medals represent for me. I tinkered with the idea of a beaded necklace on sturdy wire, but settled instead on a small rosary bracelet. It was simple and suited both my beading skills and the "every day-ness" of my medals. I wanted something I could wear always. In practice, I can't wear this when I cut raw chicken or make meatloaf. I take it off when I'm scrubbing toilets. But, for the most part, it's with me. The unexpected benefit to having a bracelet instead of a necklace is that now I see my medals all the time. There they are, framed by delicate, lovely, small pearls, and little bits of pink--a constant reminder that Mary was lovely, little, hidden, and joyful. The bracelet reminds me that the goal is to be full of grace. Mary lived a humble, hidden life in Nazareth. She loved her baby well and filled herself with His being. He grew inside of her and He grew alongside her. She spent the days of His childhood in relative quiet-- Our Lady of La Leche, a gentle woman with a holy baby at her breast. God was with her, all the time. When I see the medal, often throughout the day, I whisper a prayer: Pray I will be little; pray that I want nothing more than to be with Him as I go about my daily round and I answer the call of my vocation. Let me see your Son in my children. Let me be full of grace. How can we be filled with the grace of the Holy Spirit? That means that there is nothing in us but the Holy Spirit. If it's all Him, there's nothing left of me. The only thing that stands between me and the perfect indwelling of the Holy Spirit is pride. Pride is being full of me. And the only way to be full of grace is to be humble and little in the arms of Our Lord. I have to empty myself of my pride so that He can pour His grace abundantly into my being. Let go! Let go of the fear, let go of the urge to control it all! St. Therese writes that " sanctity is an interior disposition which makes us humble and little in God's arms, conscious of our weakness and trusting even to audacity in the goodness of our Lord." Can we do that? Can we trust--even to audacity--in God's goodness? We can if we allow ourselves to be filled with grace. I don't live in Nazareth. Mary didn't have a computer and a telephone. She wasn't a soccer mom. Her husband didn't travel every week. Our lives are so different. And they are so similar. We are both women whose hearts long to hold the infant Lord. She had no need for reward or recognition; she lived her whole life looking towards her Son. The people whose lives she touched followed her gaze. She looked away from herself and to the source and summit of life. It was a simple way to live, free from earthly drama and self-centered turmoil. Mary's life was simple and mine can be, too. She told me exactly how to live the life of simplicity that will leave me open to grace: Do whatever He tells you.Always, she points us to her Son and His Word. Whatever He tells you. Is that so hard? Well, sometimes. But it is simple. With every decision I have to make, I can consider one thing alone: How will this help me get to heaven? Simple. Humble. Mary-like. Mary had limitless faith. She issued her fiat without stopping to intellectually examine the seeming impossibility of what the angel had told her. If God said it was so, that was good enough for her. All she wanted was God's will for her. That's it. A straight and narrow path to heaven is the will of God. Every single day, Christ asks us to be His handmaiden. Sometimes, He is asking so much of our fragile, human selves. Sometimes, the cross is nearly unbearably heavy. But always, He will give us the grace to accept His divine will and live in His love. I am reminded of purity of heart when I think about the Blessed Mother, particularly Our Lady of La Leche. How single-minded we are for our children when they are suckling at our breasts! How small our world becomes when it is just the two of us, intimately connected and gazing with mutual adoration. Love like that seems so pure. Yet, it is not nearly the pure love Our Father has for us, nor the pure love we aspire to have for God. That is the love the Blessed Mother had for her Son and that is the love she wants so much for us to have as well. Father Jean C. J. Elbee writes, "Mary was all love because she was completely pure. Purity is not only exemption from any stain, from any sin.Purity is often synonymous with the absence of sin. What an error it is to stop there! To drive away darkness we need light. The absence of sin is a condition; but what we need beyond that is the positive beauty of sanctifying grace--that is to say, the Holy Trinity in us. That is purity: Mary, full of grace." Our Mary table this year is simple. A small bowl holds flowers to be wrapped around a wreath we made of Sculpey. When the children serve each other, they wrap a flower around the wreath: a gift for the Blessed Mama! There is a May basket that was delivered by a friend, an icon the never fails to remind me of another woman who prays daily for the simple, hidden holiness of Mary, and a statue that holds holy water. 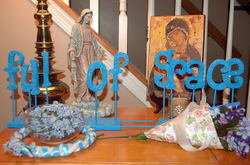 I so loved my Alleluia letters, that I re-invented the idea for May and this month's letters remind us that our heart's desire is to be full of grace. It is my prayer, my friends, that the Lord is with thee! Visit Helen at the Castle of the Immaculate to read the Loveliness of Marian Devotion Fair.